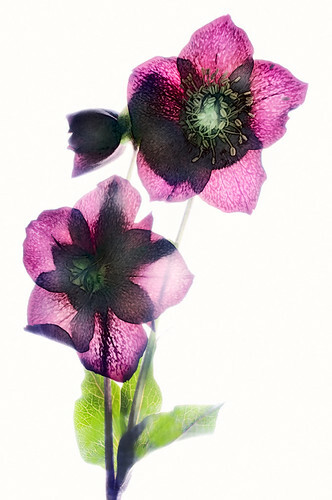 Hellebore on White, photo by Harold Davis. View this image larger. The image above was the first version of this photo. 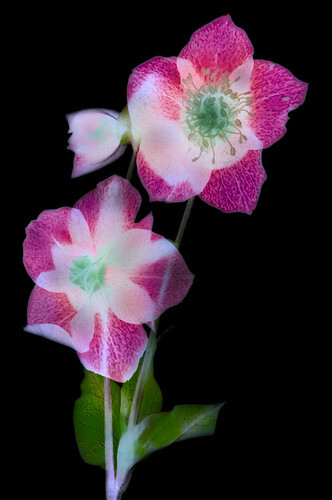 I used a flourescent light table as my illumination source, and overexposed for transparency. I combined three different exposures, each with a different shutter speed but the same aperture, to get the effect I wanted (see exposure details below). Some other black and white flower pairs: Faerie Bouquet and Faerie Rose on Black; Anemone Japonica and Anemone on Black; Dawn Chorus Poppy on White and Black. McWay Creek Falls, photo by Harold Davis. View this image larger. 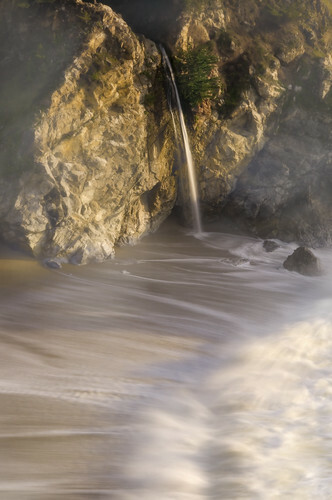 McWay Creek Falls can be viewed from the observation trail at Julia Pfeiffer Burns State Park in Big Sur. The short trail is neat: it follows the creek, then pierces a tunnel beneath Highway 1 before ending in dramatic cliffs over the Pacific. The spot is obviously photogenic: one of those places like Tunnel View in Yosemite where there are always photographers in any half decent light. These places may be visited at night to experience them as a solitary photographer, but that’s a different story. My interest when I photograph one of these photo mecca spots is to try to come up with something different. I’m bored with the notion of repeating someone else’s great shot, however great it was the first time. On this winter time visit to Big Sur, the surf was higher up the beach at Julia Pfeiffer than I’d seen it before. So my idea was to make as long an exposure as I possibly could so that the surf coming up the beach would become like soft lace and the waterfall would, in contrast, seem to solidify. I took this photo a little after 4PM, and it was still bright. Clearly, I couldn’t tax the kids and their patience by waiting around to sunset when there would be less light (and a consequently longer exposure). Between us, I would have dearly loved to do so. So I stopped the lens down as far as I could (to f/36), and added a polarizer (really, I would have prefered a neutral density filter if I’d had one with me!) to cut down the light a bit more, and managed to eke out a 1/2 second exposure. 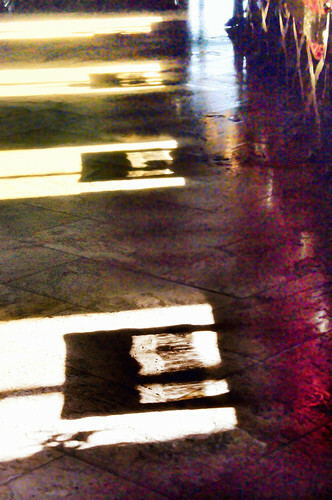 Solar Bisection, photo by Harold Davis. View this image larger. One of my favorite spots for observing sunset over Mount Tamalpais and the Golden Gate is a vacant lot on upper Euclid Avenue in the Berkeley Hills. I don’t know the real estate history of this lot, but it seems at this point like a small city park with a fence protecting people from the drop that overlooks the view. I’ve tried the solar bisection of the tree trunk idea at this spot before. The trick, of course, is a matter of timing: there’s only a split second in any given sunset in which the sun will be in the right position. 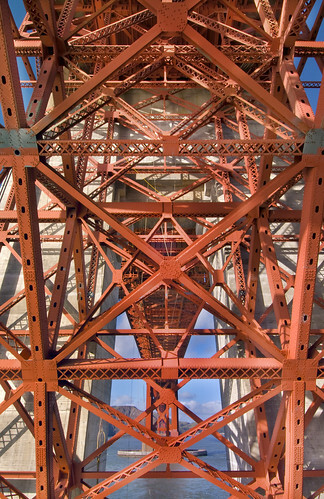 Underneath the Golden Gate Bridge, photo by Harold Davis. View this image larger. With the top floor deck of Fort Point repaired and open to the public, it’s now possible to worm one’s way out on a fortified tower that sits directly under the Golden Gate Bridge. On a recent clear, windy, and cold day I explored the place with Julian and Nicky (who have a love of all things fortress and castle). 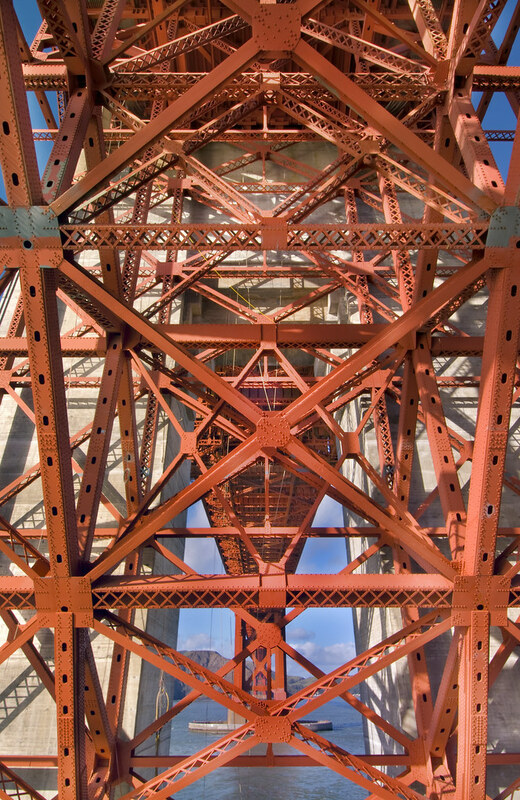 The underparts of the Golden Gate Bridge span looked like a giant erector set. I used a wide angle lens fully stopped-down for maximum depth of field to get both the “erector set” girders and the distant parts of the bridge in focus. Related story: X Marks the Spot. So It Begins, photo by Harold Davis. View this image larger. The lunar eclipse a few nights ago was already beginning when I got to Inspiration Point. Later, as the eclipse got fuller, it would be an issue of finding gaps in the cloud coverage. But to start with, the issue was to avoid overexposing the moon, surprisingly bright and still glowing with reflected sunlight, in a sky that wasn’t fully dark. Fortunately, I’ve had enough bad experience with washed out and overexposed moons to know to stop this one way down compared to the camera’s light reading. Water Jewel, photo by Harold Davis. View this image larger. 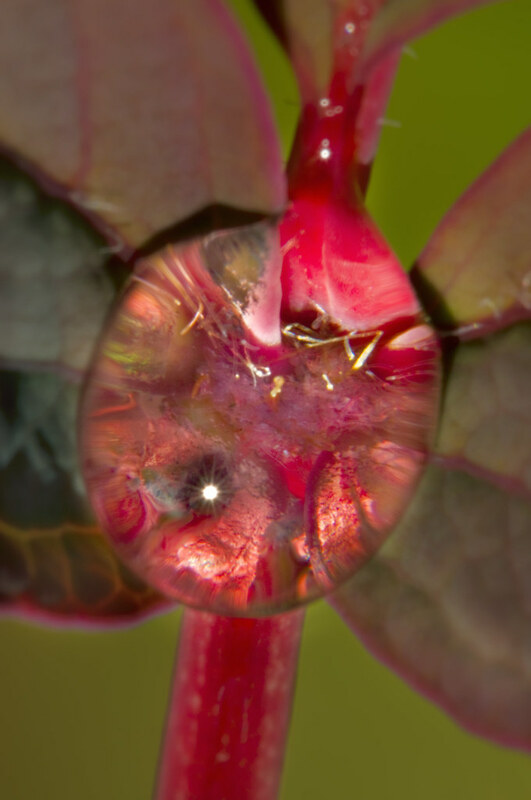 As sunshine came through the rain clouds I photographed this water drop on our peony bush. There’s nothing like a water drop formed by rain and lit by sunshine for creating a whole minature world of color. Related images: Waterdrops on a Peony Leaf; Earth in a Drop of Rain; Drops of Sky; Mars Attacks. 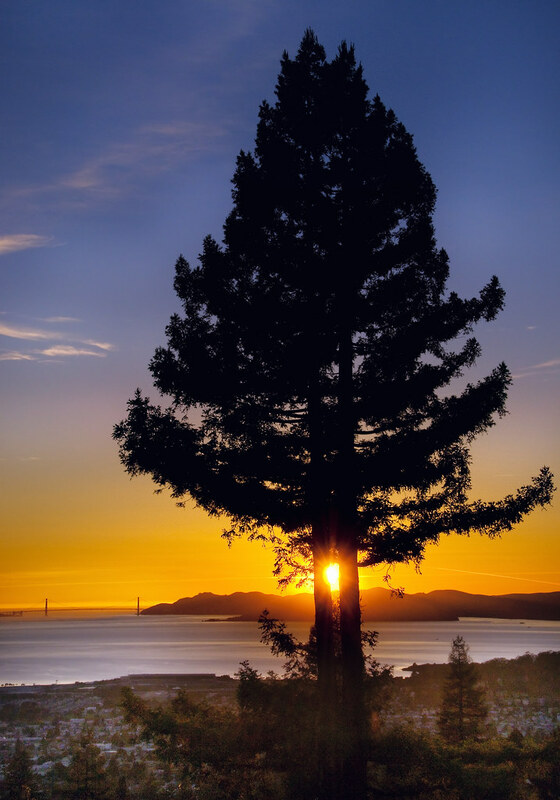 Hayward Marsh, photo by Harold Davis. View this image larger. The San Mateo Bridge crosses San Francisco Bay roughly half way between San Francisco and San Jose. Many commuters rushing over the bridge probably don’t know that an interesting wilderness area lies on the northeastern side of the bridge. Hayward Regional Shoreline consists of 1,713 acres of salt, fresh, and brackish water marshes, seasonal wetlands and public trails. The view here is looking west towards San Francisco Bay with the San Mateo Bridge on the left. Cogswell Marsh, straight ahead, once used solar drying to produce salt. 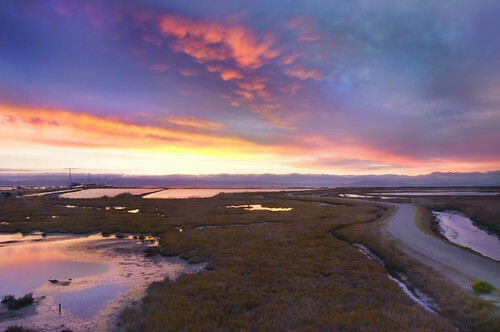 Hayward Marsh, to the right, is partly supplied with fresh water using Hayward municipal treated waste water. In this area there’s a preserve for the endangered Salt Marsh Mouse. This mouse only lives in a couple of places in the marsh land around San Francisco Bay, with the Hayward Marsh the largest species habitat. It feeds on pickleweed and other saltmarsh plants, and remarkably has developed kidneys that can process the salt water it drinks. Over the recent four-day weekend, Phyllis and I and the boys went for a hike in the Hayward Marsh. The boys ran ahead to play in the mud flats that border the Bay, and I snapped this photo of the landscape. Memory Palace, photo by Harold Davis. View this image larger. This digital photo collage is an elaboration of Dream Palace, itself a manipulation of a photo of William Randolph Hearst’s over-the-top underground swimming pool. A memory palace, also called a method of loci, was a mnemonic system used for complex memorization in the days before external memory devices were common. If you couldn’t write something complicated down, how were you going to remember all the details? A memory palace mentally pairs rooms in the imaginary palace with segments of the material to remember. Often the best mental memory palaces are based on an actual physical place. If you want to try to construct a memory palace to help remember something complicated, here are some instructions for going about it. 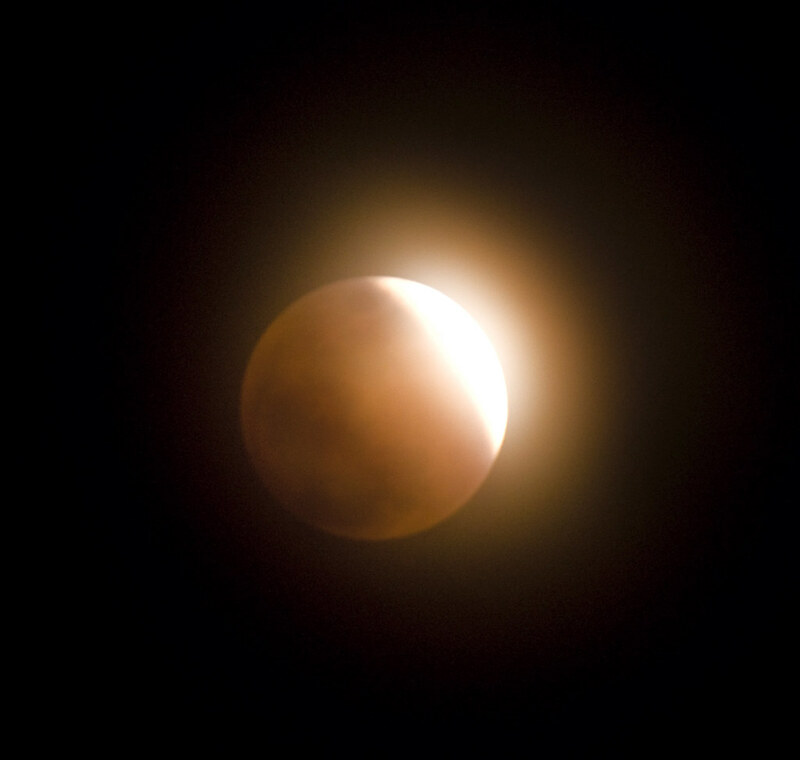 Lunar Eclipse, photo by Harold Davis. View this image larger. 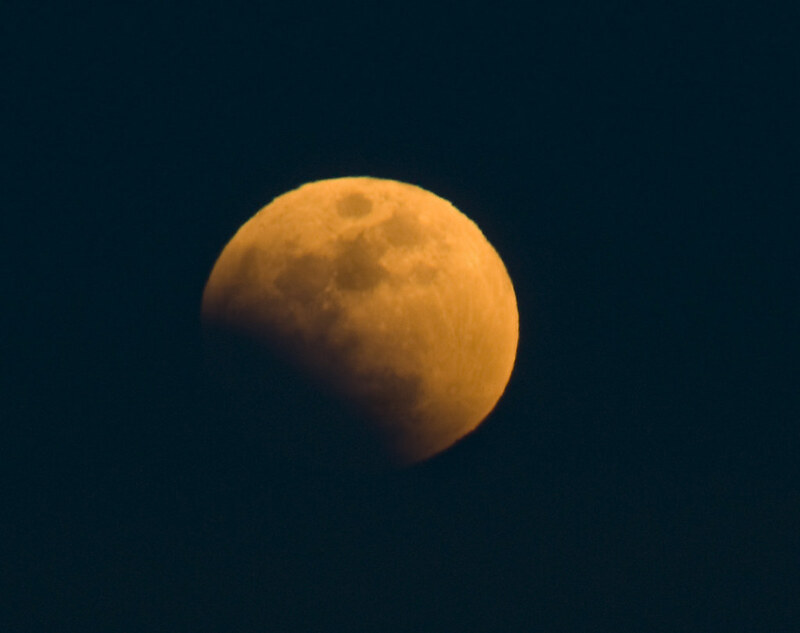 A full lunar eclipse was scheduled just after moon rise in the early evening in the Bay area. My hope, foiled by roiling cloud cover blowing in through the Golden Gate, was to photograph from Marin Headlands with San Francisco and the Golden Gate Bridge as background. Instead I headed east to Inspiration Point in Tilden Park in the coastal range. Parking the car, I hiked in a mile or so to a ridge with a great view of the show. As the evening got dark it grew cold, and the clouds covered the moon. Even so, I got in a shot or two and enjoyed the spectacle and solitude. 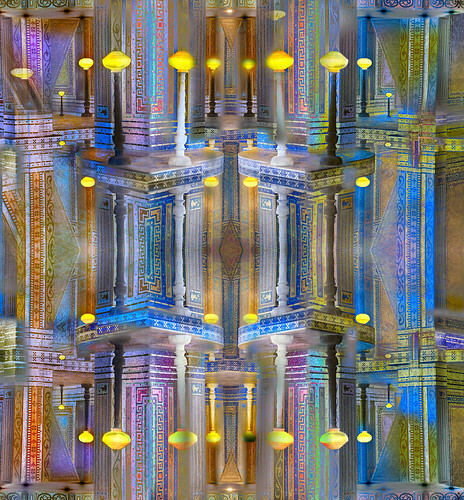 The image below is a digital collage, meaning a Photoshop composite created by blending layers. As these collages go, this is a fairly simple piece. All the elements in the collage come from a single dSLR capture using my Nikon D300 (see below). So I’m able in this story to show where each element in the final digital collage comes from, how I generated the elements from the one capture, and how I put them together. To combine the three “panels” of my triptych, I started a new image sized to be three times as wide as the original, and then I added each element as a separate layer. With this kind of effort, one of the most difficult things is to know when to stop. I’ll be writing about knowing when to stop in another story. Some related stories: When Is a Photo Not a Photo; Variations, Resistance to Spirals Is Futile; World without End. Rose Bouquet from Above, photo by Harold Davis. View this image larger. This is a subsequent photo of the bouquet of roses, with the buds a bit more open, and angled from above rather then showing the full bouquet in profile. As compared with the first photo, I also lit the flowers for more softness of color. This is one of those photos that appears fairly effortless. As indeed it should. But in fact, the image took a great deal of work. The most difficult problem was caused by an issue of lens focal length. I wanted to be able to see the entire circumference of the bouquet of roses; at the same time I didn’t want the photo to capture tripod legs, lighting apparatus, or the edge of the black velvet background. With my tripod fully extended (three legs plus center column), approximately 40mm (60mm in 35mm terms) would have done the trick. This would seem to have indicated my Nikon 18-200mm VR zoom lens, which I enjoy using as an all-round lens, and certainly includes the desired focal length in its range. Unfortunately, however, when you point this lens straight down, the zoom “slips” out to its longest setting, so I couldn’t use the lens for this purpose. I ended up raising the height of the tripod by putting each foot on a chair and climbing a short ladder myself. With a little cropping in the post-processing, my 50mm Sigma macro lens (75mm in 35mm terms) was now just right. This whole setup was truly pretty jerry-rigged and rickety, and not at all the kind of slick shooting situation you’d expect of a pro photographer. You can see a somewhat similar set of circumstances that involved a diaper box as a platform when I photographed this wasp. In both cases, the point is that it worked, and that I didn’t break my keister, not the slickness of the setup. So that the white roses didn’t blow out, and the orange and pink roses on the left remained vivid, I combined three different exposures to get the final result. Proving once again that a digital camera is a computer with a lens on front, yesterday I upgraded the firmware (or BIOS) of my Nikon D300. This was a simple process. I downloaded the file containing the up-to-date firmware to my Mac (of course, you can use a Windows PC as well). I de-compressed the file, and copied it to the root directory of a Nikon D300 formatted memory card attached to the computer with a card reader. Next, I loaded the card into the camera. From the camera’s Setup menu, I chose Firmware, followed by Update, and confirmed the command. You do need to be careful not to turn the camera off while the firmware is updating, and to follow instructions for the process precisely (a link to detailed instructions appears below). There are two sets of firmware, for the D300, A and B; this upgrade only concerns the A firmware. As of the date of this story, the most current revision of the firmware is 1.02A. Most people who own D300s will have older versions, and probably should upgrade. You can check your firmware version by choosing Firmware from the camera’s Setup menu. Links: Detailed instructions for the Mac; Download for the Mac; Detailed instructions for Windows; Download for Windows. Well-known textile artist Virginia Davis is having an exhibit of her beautiful and provocative woven canvas imagery at the Noho Gallery in New York April 1, 2008 through April 19, 2008. Worth noting: not only is Virginia’s art fabulous, she is my mom, and a fabulous mom. Check out her website. Patchwork 3 © Virginia Davis. Bouquet of Roses, photo by Harold Davis. View this image larger. 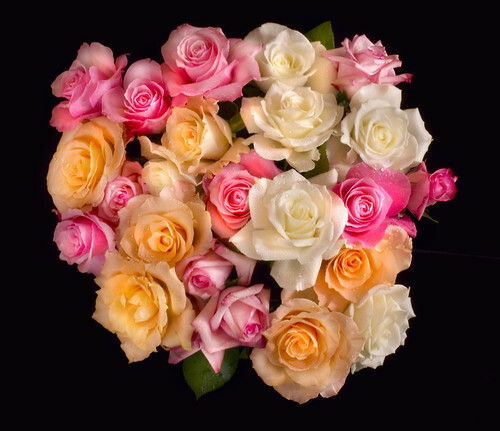 This is a bouquet of multicolored roses for my beautiful wife, Phyllis. She deserves all the flowers in the world, physical as well as virtual. After three boys, we are having another baby. 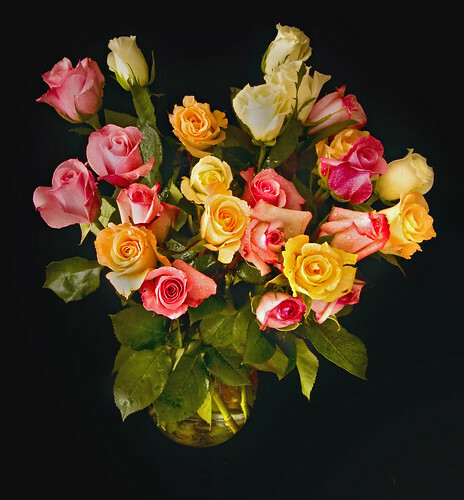 The roses were photographed on a black velvet background using sunlight focused using window shades. In this kind of situation, it is important to underexpose relative to an overall meter reading, because you want the background to go completely black, and you want the flowers to appear as saturated as possible. Pool, photo by Harold Davis. View this image larger. This story is going to be one big whine about Hearst Castle as an abomination of an ersatz tourist trap and a monument of hagiography of a capitalistic pig paid for with public money. But before I get to the ranting, let me explain the photographic problem that the two images that go along with this story illustrate. If you are interested only in photography, feel free to skip the whining. When you get on the tourist bus up to the castle, they make it very clear that you can’t use flash, you can’t use a tripod, and you can’t bring a bag of gear with you. Most of the interior spaces of the castle are pretty dark. So what’s a photographer to do? I decided to see if I could use high ISO photography for something besides a fish tank. I set my D300 to ISO 6400, and left it there. The photo above shows the inside of one of Heart’s swimming pools at ISO 6400, 1/125 of a second, and f/5.6. Perfectly reasonable for hand holding, and the noise adds a nice Venetian effect to go with the overly decorative swimming pool. The photo below shows the shadows of the tasseled chairs in the baronial dining room. This was the kind of dining room that served ketchup and condiments out of the jars along with ranch food and baroque table settings. 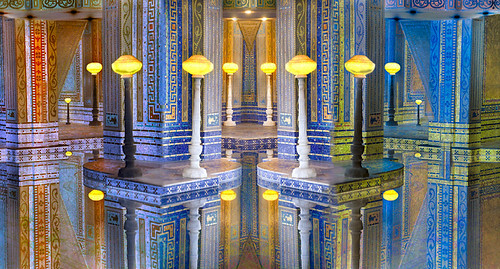 William Randolph Hearst’s rear end probably sat in one of the chairs whose shadows are shown in this photo. I wanted plenty of depth of field. This is a situation that would have called for a tripod. Instead, at ISO 6400 I handheld for a 1/50 of a second at f/32 exposure. Warning: here comes the whining and ranting. I almost don’t know where to start. So let’s start with the place itself. 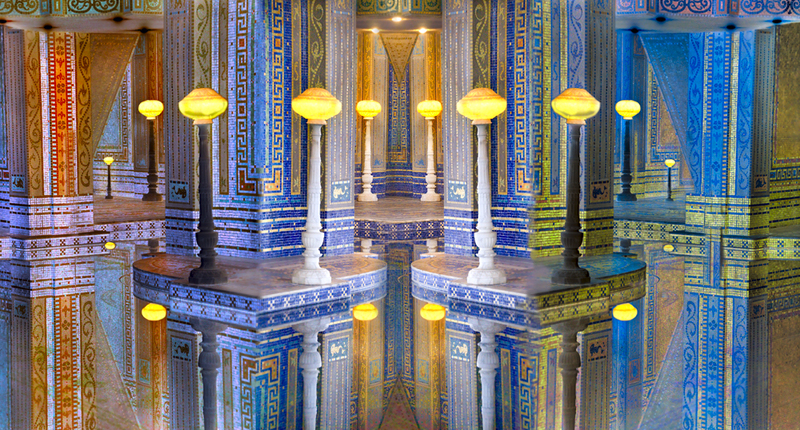 There are some wonderful decorative touches by architect Julia Morgan, who put bread on her table with Hearst Castle for more than twenty years. But despite tour guide and widescreen-big-movie-that-comes-with-the-admission-ticket-and-you-have-to-sit-and-see-even-on-a-beautiful-day-particularly-if-you-are-traveling-with-kids claims that this building somehow exemplifies Spanish and Italian vernacular religious architecture, the only thing Hearst castle exemplifies is gaudy and tasteless California mish-mash. In fact, Hearst Castle may have set the gold standard for ostentatious, tasteless, and awful that all other California buildings only aspire to. The Hearst family seems to have done themselves well out of this setup. They kept 35,000 acres as a private ranch and vacation retreat, and donated to the state the expensive to maintain hundred acres that the castle building sits on. Off-loading the expensive maintainence headache to the taxpayers was very slick, and it seems that as part of the deal they got sentimental tributes to the Hearst family greatness in the required film, with violin music in the background. The material does recount a bit about the great Comstock silver lode, but there is an absence of information about the (apparently hereditary) family fondness for showgirls, and no mention at all of Patty Hearst. By the way, this isn’t a cheap place to visit. The basic tour for one adult, a six year old, and a ten year old cost $40.00. On the crammed bus ride up the hill, along with the prohibition on flash, the recording tells one that it is OK to take photos for personal use, but they can’t be published except with written permission. This seems really unreasonable for a facility that is supported with public money, and mostly about keeping a monopoly on tourist tchatkes. 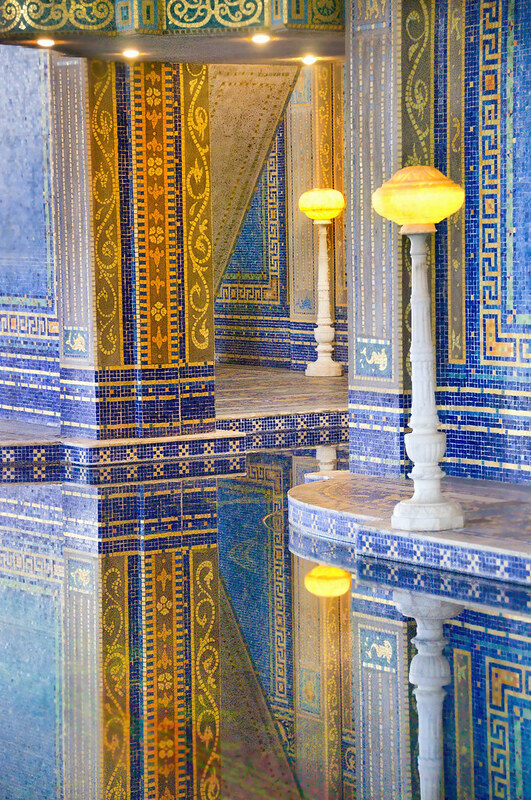 So here and now, Hearst Castle people, I’ve published these photos in my blog. I don’t have permission. Come and get me.